When it comes to desserts, it’s all about balance. The sweetness needs a little contrast to make it interesting and exciting. Soft and chewy needs a bit of crunch and bite to keep you coming back for more. 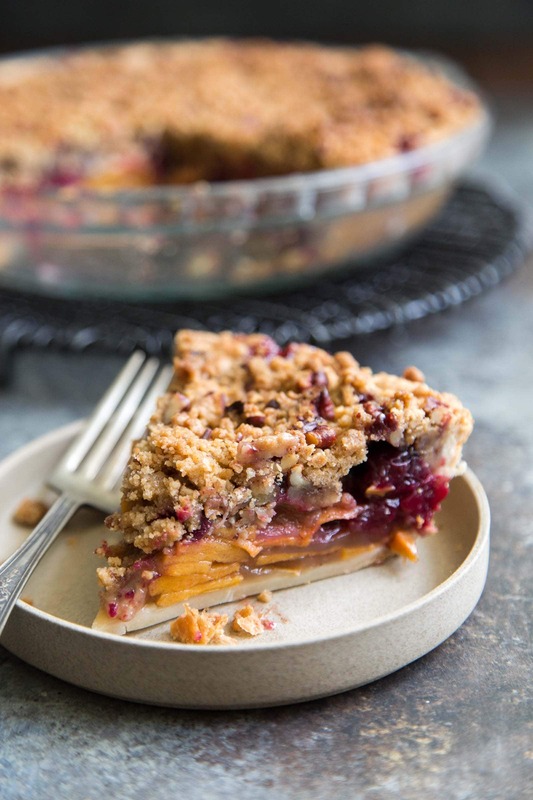 This persimmon cranberry pie checks off all the boxes! This recipe uses fuyu persimmons. Of the persimmon varieties, they are the most commonly available at markets. Fuyu are best eaten like apples, when they’re firm. Persimmons have a very unique flavor. I can’t really describe it other than… it’s sweet. 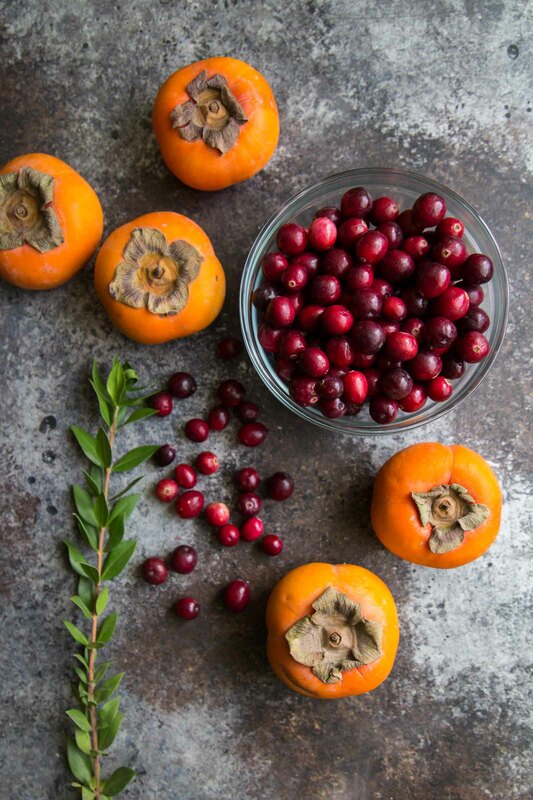 The sweetness of fuyu persimmons pair beautifully with the super tart cranberries. Plus, look at that color! The orange hues from the persimmons mixed with that crimson and burgundy red cranberries screams autumn-time. Just looking at the fruits gets me all excited for Thanksgiving and all the holidays and gatherings that follows. The raw fruits gets tossed in sugars and spiced with cinnamon. 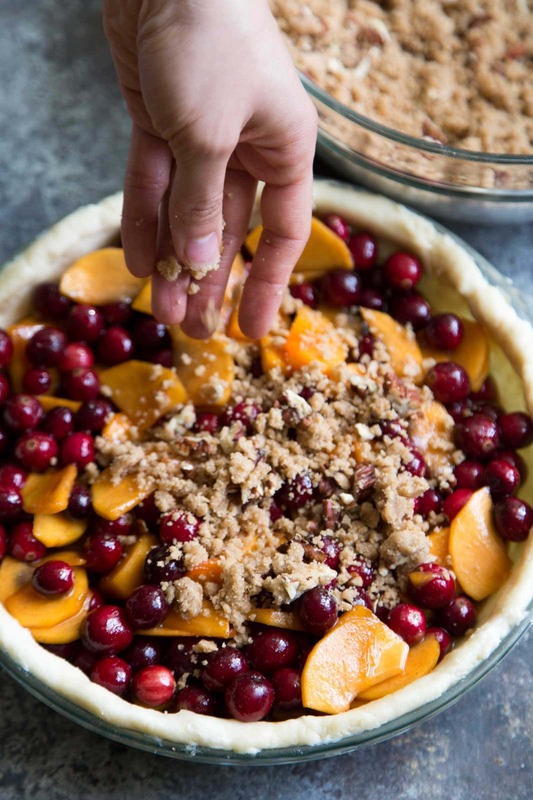 As the pie bakes, the cranberries will burst and the persimmons will slightly soften. 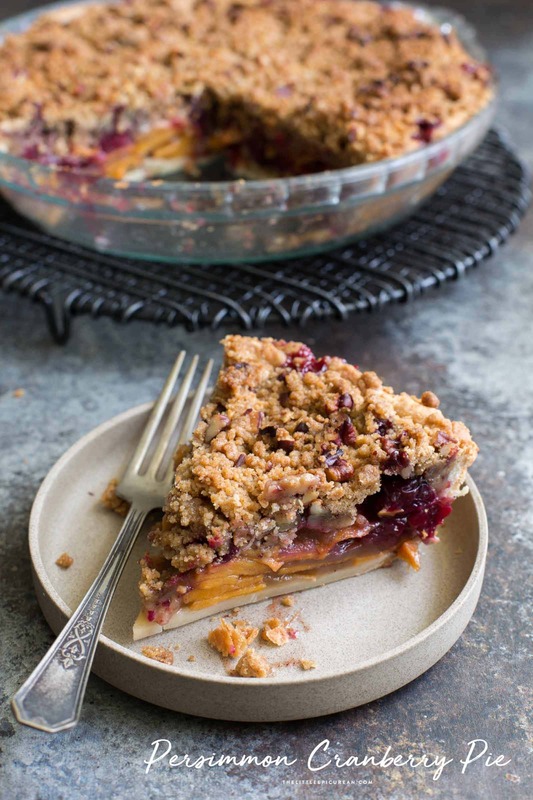 While the persimmon cranberry pie is perfect the way it is, it wouldn’t hurt to add a scoop of vanilla ice cream. Warm up the pie and serve it a la mode. The contrasting temperatures of the warm pie and cold ice cream is heavenly. In a large bowl, toss together flour, salt, sugar, and diced butter. Cover with plastic wrap and let chill in the freezer until bowl is cold (about 5 minutes). Using a pastry blender (or two forks), cut cold butter into cold flour until mixture resembles coarse, pebbled sand. Add vinegar and ice water. Fold to combine. Dough will be shaggy. Dump dough onto a lightly floured work surface and knead until mixture comes together. Pat dough to a thickness of about 1/2-inch. Cover in plastic wrap and let chill in the fridge for at least 1 hour (overnight is best). Toss persimmon and cranberries with sugar, brown sugar, maple syrup, cinnamon, salt and cornstarch. Allow chilled dough to sit at room temperature for 5 minutes before rolling. Roll dough on a lightly floured work surface to about 11-inch in diameter and about 1/8-inch in thickness. Place pie plate upside down over the rolled dough to ensure it is the correct size. Transfer dough to pie plate and firmly press into the bottom and sides of plate. Trim excess dough. Pour persimmon cranberry filling into pie shell. Sprinkle pecan crumble topping all over filling. 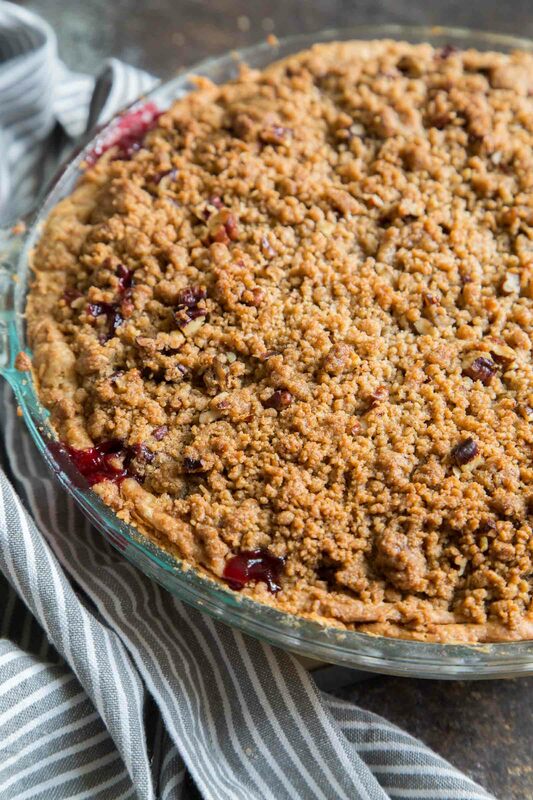 Bake for one hour until cranberry filling is bubbling and crumble topping is golden brown. 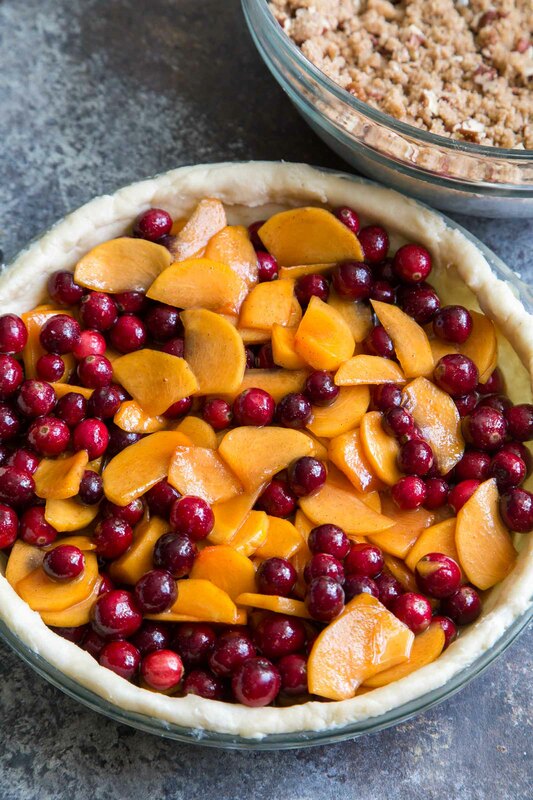 Allow pie to cool to room temperature before slicing. 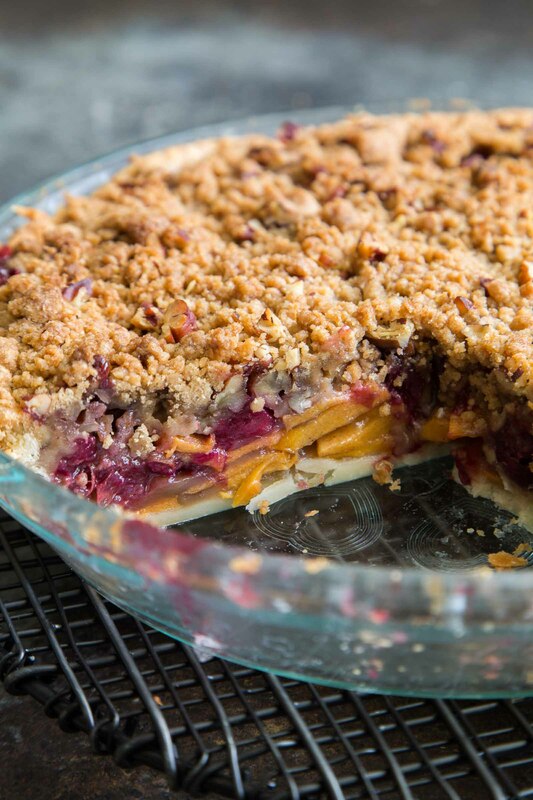 Once pie has cooled, you can also store it in the fridge to chill for easier and cleaner slicing. Serve pie at room temperature, warmed up, or chilled. Apple cider vinegar prevents gluten development in the pie dough. This means the pie dough will be easier to roll out, plus it will not shrink during baking. You will not taste the vinegar after baking. Hi Mary Anne! It’s like you read my mind with this pie! I just came home from my mom’s house with two grocery bags full of persimmons and this week I bought 3 bags of cranberries, 1 for cranberry sauce and two for some dessert experiments! Can’t wait to try your recipe. Thanks! i love fuyus! (can’t say the same about hachiyas, which i find mushy and iron-y in the way that spinach is). this sounds like such an awesome thanksgiving pie- both classic from the cranberries and new/interesting from the persimmon.